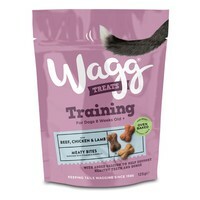 Wagg Training Treats for Dogs are delicious meaty bone shaped treats that have been made with 3 distinct flavours: chicken, beef and lamb. Perfect as a treat or training aid for any dog over 8 weeks old, the treats have been made with added yoghurt for healthy teeth and bones and come in a handy bite size for easy handling. Good size for training however too many gives teddy a poorly tummy. I do use them but limit how many he gets in one go to 3/4. One of my dogs' favourites, both really enjoy and will do tricks for them. Really good value for money.